I love dishes. And I love using them in the design of a room. They are such a simple way to add details to a room. You can find dishes so many places too, at thrift stores, consignment shops, on eBay, and probably even on Craigslist. 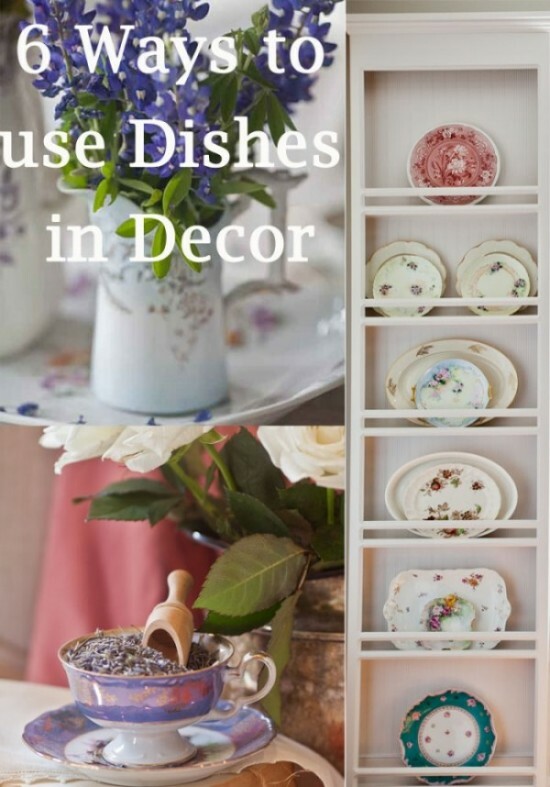 Here are 6 ways to use dishes in a room. 1. In a glass front cabinet. The cabinet can be a small one, or a big one, it just needs glass in the doors. 2. Holding fresh flowers. You can use a pitcher, a teapot, or a sugar container. 4. In a cabinet. 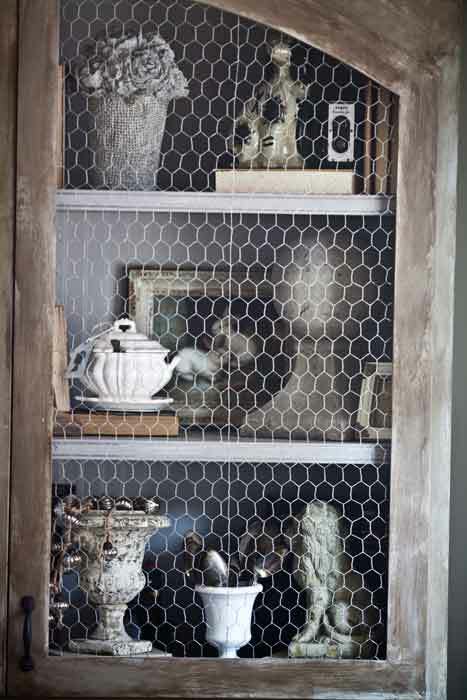 This one has chicken wire in the doors, but you could display the dishes in open shelving as well. 5. On a wall. Here I used a plate rack, but the plates can be hung directly on the wall. 6. Sitting out. These places were provided by my fabulous partner, Heritage Lace. Thanks for the ideas. 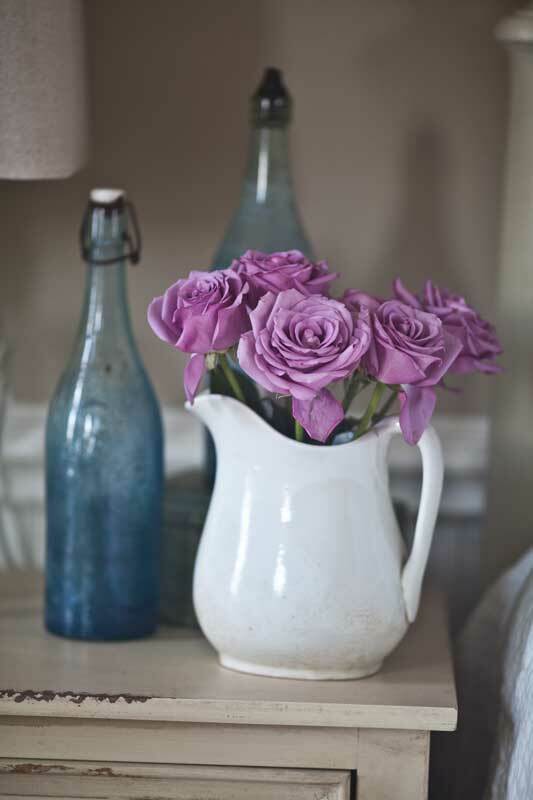 I like the idea of using a tea cup to hold lavender-that would be a great way to hold any type of potpourri and display an heirloom cup or pitcher. 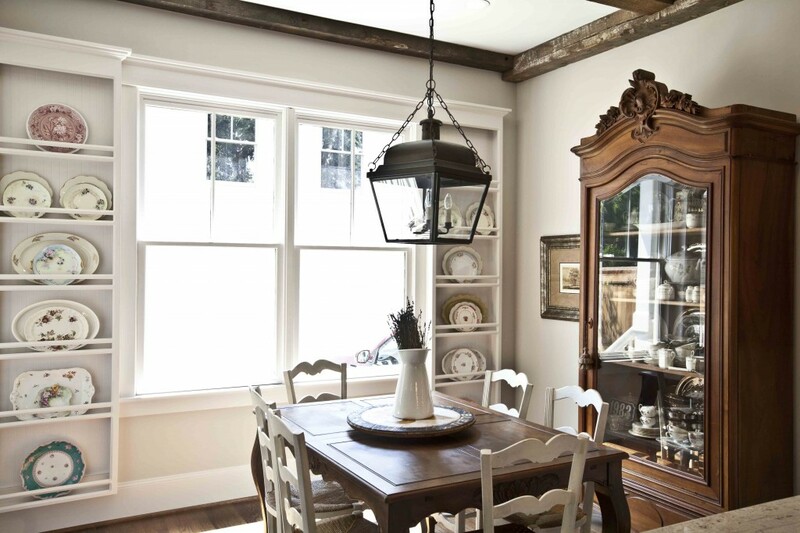 I had upper lighted cabinets that go up to the ceiling to display pretty dishes when I renovated my kitchen. 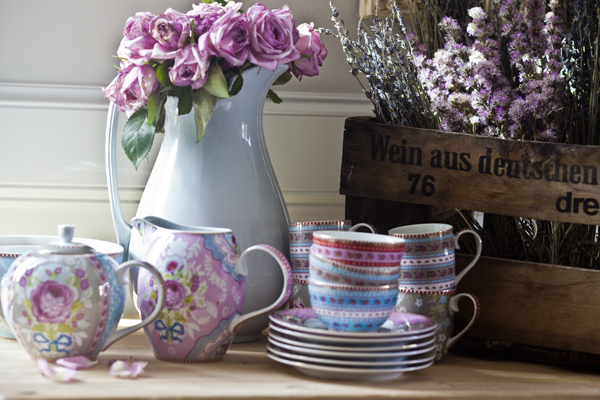 I love collections of dishes displayed, especially when they all blend together. I love to see pretty displays of dishes and I love to see them just stacked too. Great pics. I love all dishes and I’ve collected quite a few! Love the photos and so much inspiration for displaying. I am especially crazy for blue and white dishes! I find them everywhere, from Home Goods to thrift stores and on rare occasions, antique stores. We travel quite a bit and I can ALWAYS find room for one more blue and white plate, cup or bowl. I also collect red transfer ware and plain white platters. I think they all mix together beautifully. 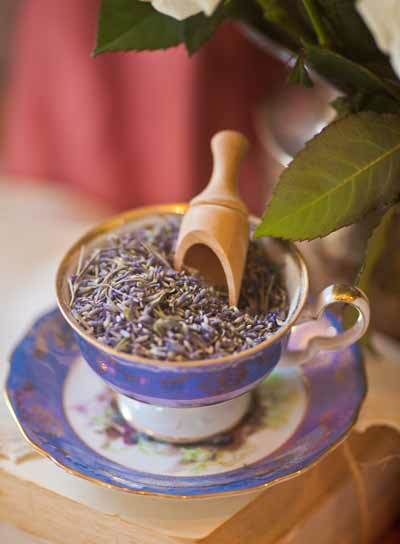 Thanks for the idea of filling tea cups with dried lavender. A beautiful display and a beautiful scent. Perfect. I love all your beautiful dishes and your ideas are great! Good ideas and I love your photos! All the color is really pretty. Just found a great one to use as a soap dish while I was in Leesburg for Lucketts!…Hope you had a great weekend! I would love to decorate using plates. Just haven’t gotten to it yet. I enjoyed all the examples you gave. I l o v e all your design ideas, dear friend, anduse several in my home decor! Those behind the chicken wire. . .splendid!! !